"Former Harvard University professor John Rinn is a Leslie Orgel professor of RNA science at the University of Colorado (UC), Boulder. More specifically, John Rinn is a faculty member of the Interdisciplinary Quantitative (IQ) Biology PhD program offered through the institution’s BioFrontiers Institute..."
"As a doctoral student at Yale University, John Rinn began groundbreaking research in the field of genetics. Following the discovery of a type of RNA known as LINC (large intervening non-coding RNA), John Rinn continued his research as a professor at Harvard University until 2017, when he accepted the Marvin H. Caruthers Endowed Chair for Early-Career Faculty at the BioFrontiers Institute at the University of Colorado Boulder, where he also serves as the Leslie Orgel Professor of RNA Science..."
"A former professor of stem cell and regenerative biology at Harvard University, John Rinn recently became the Marvin H. Caruthers Endowed Chair for Early-Career Faculty at the BioFrontiers Institute at the University of Colorado Boulder, where he is also the Leslie Orgel Professor of RNA Science. 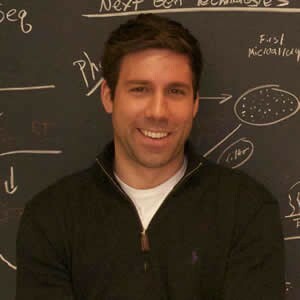 While studying for his PhD in molecular biophysics and biochemistry at Yale University, John Rinn discovered that the human genome encoded numerous new RNA genes call long noncoding RNAs or large intervening non-coding RNAs (lincRNA)..."
"As an expert in RNA and genome biology, John Rinn holds the title of Leslie Orgel Professor at the University of Colorado Boulder. John Rinn’s current research focuses on better understanding how the human genome is regulated..."
"As a HHMI early career scientist, John Rinn dedicates his research to RNA biology. Specifically, focusing on how long noncoding RNA (lncRNA) genes can play important biological roles as RNA molecules (rather than the more commonly studied protein based genes)..."
It was this question that lead the Rinn lab to move from Harvard to CU Boulder. In addition to research Professor Rinn has a long standing passion for teaching with development of graduate level RNA genomics courses to sophomore biology at Harvard that blends the fundamentals of biology with modern genomic approaches. This was another motivation to move to CU Boulder BioFrontiers that is based in integrative biology and an exciting new approach to graduate school education. John Rinn earned his bachelor’s degree in chemistry from the University of Minnesota. He graduated cumma sum laude with department honors, earned the 1999 Casmir Ilenda Award for the university’s best senior thesis research and presentation, and also garnered recognition for being one of the top 10 chemistry graduates. He went on to obtain his doctoral degree in biophysics and biochemistry from Yale University, where earned the 2008 Damon Runyon Cancer Foundation Postdoctoral Scholarship, which honors those dedicated to cancer treatment, prevention, and diagnosis. In his spare time John Rinn enjoys staying active, whether it involves road biking, playing hockey, snowboarding snowboarding or cliff diving.